Oooh! I'm up to my eyelids in CHOCOLATE! I finally swatched my new Too Faced Semi Sweet Chocolate Bar Eyeshadow Palette and I'm in love! If I had to sum up this palette in one word, I would choose the word QUALITY. In comparison to last year's Too Faced Chocolate Bar Palette, this one is sleeker (thinner & less bulky), the eye shadows are creamier and the majority apply exceptionally well (except for a couple). Too Faced has also engraved the names of the eye shadows ON the palette. The original palette only had eye shadow names printed on a clear sheet overlay. This palette has the same awesome chocolatey scent and mirror! Not only did I swatch THIS palette, but I RE-SWATCHED the original Chocolate Bar Palette for comparison. Below are my thoughts. 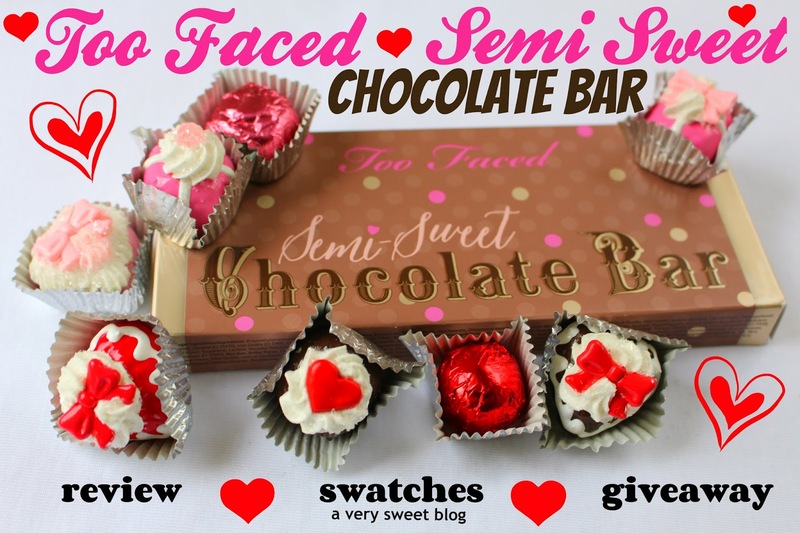 I'm giving away a Too Faced Semi Chocolate Bar Eye Shadow Palette to a lucky reader! This giveaway is open WORLDWIDE (wherever USPS ships). May the force of Willy Wonka be with you :) I hope you get the GOLDEN TICKET! Use the Rafflecopter widget below to enter. The outer box is absolutely adorable. Who can resist polka dots, hearts, gold and the color pink? And how cute are the names? I busted out my faux truffles for this post. The palette itself is shaped like a chocolate candy bar. It's lighter in color than last year's palette. It's also thinner and less bulkier than last year's palette. Here's the front & back! It smells just like CHOCOLATE! Mmmm! It contains a mirror and a total of 16 eye shadows. I was worried about the colors at first, but after I swatched them I was very pleased with the quality (except for two). I'll discuss below. Here are the 1st, 2nd and 3rd rows! In the first row, the only color that was a little chalky was coconut creme. Here are the eye shadow guides they give you. Actually it's double-sided. wow, you arranged it sooo lovely! The review is great and I am so in love with the first palette! its super super sweet!! i've been wanting this!!! crossing fingers! This is so pretty. I especially like the Candied Violet shade. The palette is beautiful another great giveaway Kim. What beautiful packaging! Thanks for the review dear - what a lovely set! If I get this palette, I'd eat it! haha Great giveaway, Kim! What an awesome giveaway! I actually haven't tried any of Two Faced Products, but I want too! Both palettes look great! Lately the Semi Sweet Chocolate Bar Palette has been keeping my interest! I hear so many people rave about how they like it! And the arangment almost got me fooled, haha. How sweet! You've got to love Too Faced's packaging. I have never tried the Too Faced palates, but I really want too! My brother's girlfriend got one for Christmas and it looked awesome! Oh my god! That palette looks more than absolutely fantastic! The colors are so covering and glittering!! Love it and want it tooooo!! Gurlll, this latest palette is STUNNING! I like the looks of it way better than the original Chocolate Bar. Thank you so much for the giveaway, fingers crossed! thank you for the chance and happy new year! I was gifted both of these palettes this holiday season and I have to say, I was very pleasantly surprised by the quality. I've never tried Too Faced before and my expectations weren't high, but as it turns out, I love both palettes - the colours give so much payoff and the chocolate scent is such a lovely bonus! Love the colors! And, love the idea of the chocolate bar. Crossing my fingers. Love the color palette. I remember when you reviewed the first palette Kim! IT's good to know that Too Faced has actually made improvements to their followup. The packaging looks even better now that's it's streamlined and it's still cute as ever! Thanks for another sweet giveaway! I loveee how you displayed this. Wonderful pictures and it almost makes me think this is an actual chocolate bar lol. Thanks for the giveaway for this lovely palette! I absolutely love the first chocolate bar and would love to add this one to my collection as well. You did a great job at swatching and the colors look lovely! I was doubting to buy the first palette, but now I will defintely go for this one! The pigment looks great as well as the packaging! Oh Kim!! I want this so bad lol!! I actuslly went to two stores today looking for it but I think it's only online right now. I didn't get the first one and I'm glad now because this one looks so much prettier in my opinion lol!! I'm glad you love it! Thanks so much for doing this giveaway!! I have been wanting this pallet ever since it came out, so it would be amazing to win! Good luck everyone! Awesome giveaway, Kim! I love the way that you arrange your photos! You make me want to buy makeup and candy, hehehe! ahh what is this deliciousness! you always find the cutest cosmetics Kim! I bet putting on makeup in the morning is so much more fun with cute packaging like this! This is so adorable because it fits the theme of your blog perfectly! I've been so excited to try out this palette and would so love to win it! Thank you for the giveaway! The colors in the palette! Fingers crossed! What a beautiful palette and I love the idea that they actually smell like chocolate. You did a great review and love the pictures. Great review. Love the colours! Thanks for the awesome giveaway. I LOVE the chocolate bar palette, so I cannot wait to try out the Semi-sweet. The swatches are so beautiful! Dear Kim, this is fabulous! I really hope to win, and if I don't, I hope to find this palette in Italy! Last year I found Too Faced eye brushes only online. Have you tried them? Very excited about this giveaway!! Thank you for the giveaway, it's very generous! I've been eyeing up these palettes lately! They just look so cute, not to mention the gorgeous colors in both of them! thank you so much for this giveaway! I have never tried the first chocolate bar but this one looks amazing!!! I've never tried the brand. Thank you! very nice shades of too faced chocolate! !~ ty for this giveaway! I´d love to win that palette, but if I don´t I´ll go and buy a big chocolate anyways! The candied violet looks lovely!! wow, such a great colors, such a beautifull swatch!!! <3 i want this! thank you for the chance! Awesome giveaway! I love Too Faced products. Would be so nice to win a new palette. Thanks for the chance! Truly lovely colors, I would love to try out all the different looks. Very nice selection of colors and amazing packaging! Thank you for this giveaway, the prize iz great! Thank-you for a chance to win this great palette. I have someone in mind who would LOVE this, even more than I would! Thank you so so much for this giveaway!!! SUCH amazing swatches you have!!! Oh man I would love to get my hands on these palettes! Thanks for the giveaway! This looks awesome! I am in dire need of a new palette, thanks for this review! Amazing photos. Looks profi and amazing review! I have just recently become interested in a better, more sustainable, cruelty-free lifestyle. I am ditching all of my cheap, awful cosmetics. Too faced cosmetics are what brought me here, and I will stay tuned, because I have no idea how to do my makeup. Haha. If I can figure it out half as well as you have, I'm set. Are you sure you're not supposed to eat this? Haha! Wow, these colors are so awesome! Would love to have this. Thanks so much for the giveaway. Happy New Year to you.